Kansas guard Lagerald Vick (24) looks to make a mov against South Dakota guard Triston Simpson (3) during the first half, Tuesday, Dec. 18, 2018 at Allen Fieldhouse. Playing their first true road game against a ranked opponent in an environment that has been looking forward to this game since the nonconference schedule came out, the Jayhawks figure to get one of their toughest tests to date against the 18th-ranked Sun Devils. Arizona State has just one win all-time against the country’s No. 1 team and that came in the early 1980s. The opportunity to not only get a signature win for the 2018-19 team but also to become a part of program history has the Sun Devils — and their fan base — busting at the seams with excitement over the possibilities. 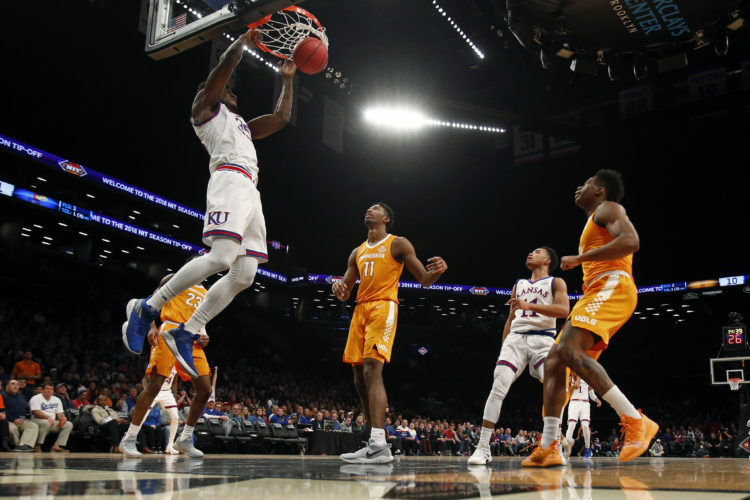 The big stage certainly will not be anything new for Kansas, but playing on a neutral floor in Indianapolis or Brooklyn, N.Y., is a far cry from playing on campus of a ranked opponent. Self said earlier this week that he wished his team’s nonconference road games at ASU and Kentucky (Jan. 26) would have come earlier in the schedule, and added that tonight’s outcome, win or lose, will be good for his team, especially the younger players going through it for the first time. Both teams play up-tempo styles — ASU ranks 79th by KenPom.com in adjusted tempo and KU 92nd — and turnovers committed and forced could also play a huge role in this one. In last year’s Arizona State loss at Allen Fieldhouse, it was the Sun Devils’ 3-point shooting that doomed the Jayhawks. This is a much different Arizona State team than that bunch, though, and it’s not likely that either team will rely too much on the 3-point shot to win this one. ASU ranks 320th in the nation in 3-point attempts per game, just slightly ahead of KU’s No. 329 ranking in the same category. 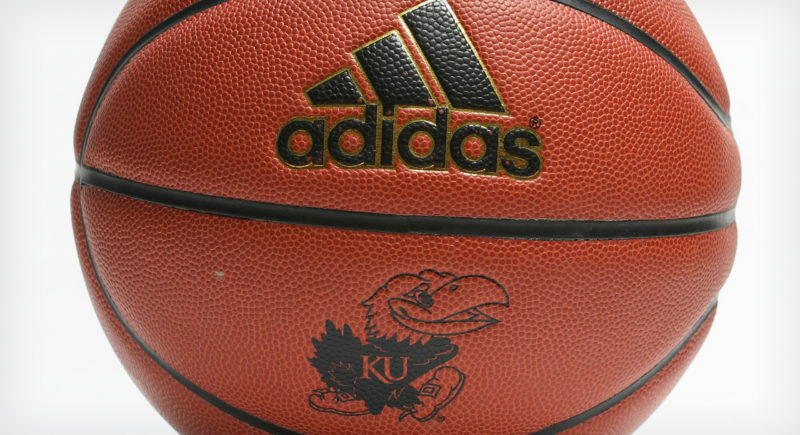 Thanks largely to the play of leading scorer Dedric Lawson, the Jayhawks rank 35th nationally with nearly 56 percent of its points coming on 2-pointers, while Arizona State ranks 33rd in the nation at the free-throw line, getting 24 percent of its points at the line. Self talked a lot this week about wanting to see defensive improvement from the Jayhawks and, at least in this one, that will mean sliding their feet, extending out to make it hard for the Sun Devils to initiate offense and playing without fouling. Although ASU shoots just 68.3 percent from the free-throw line, the Sun Devils are getting there an average of nearly six times more per game than their opponents. Arizona State is a big, strong, tall team that likes to win games on the glass and KU is going to need more than the standard double-digit rebound total from Dedric Lawson to get by in this one. That’s especially true without 7-foot junior Udoka Azubuike, who Self called “doubtful” for this one. Statistically, Arizona State is the seventh best defensive rebounding team in the country, limiting opponents to just 8.6 offensive boards on just 22.1 percent of opportunities. What’s more, the Sun Devils are averaging 10.6 more rebounds per game than opponents — 5.3 offensive and 5.3 defensive — and have been outrebounded just one time in 10 games. 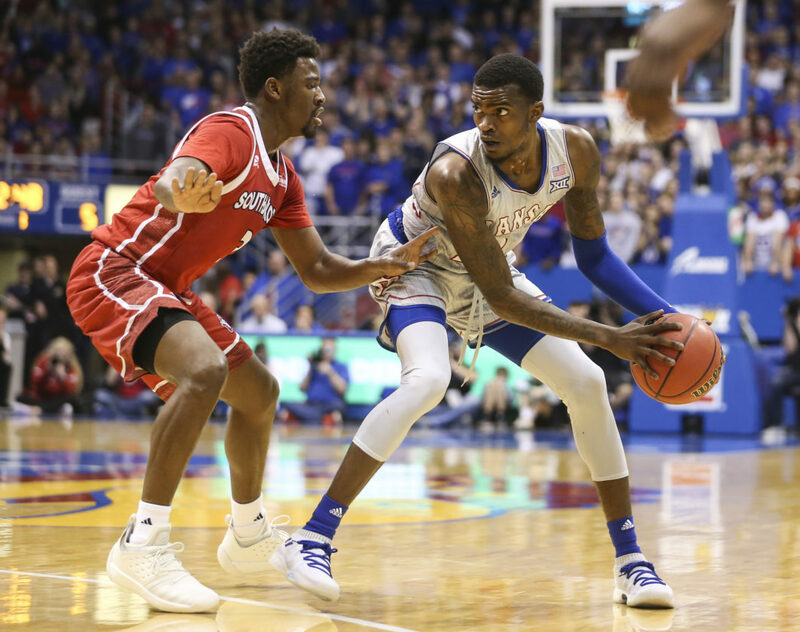 A week ago, KU sophomore Marcus Garrett was tasked with slowing down Villanova big man Eric Paschall during the Jayhawks’ 3-point win over the defending champs at Allen Fieldhouse. 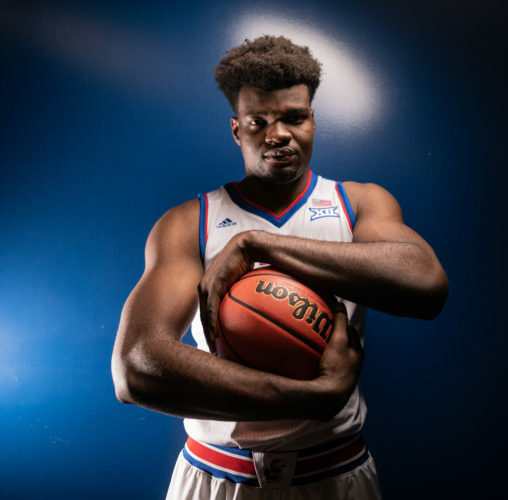 Today, the 6-foot-5 Garrett will be asked to run with ASU’s top guard, Luguentz Dort, who brings a blend of size, speed, physicality and scoring punch that few players in the nation can. While Garrett might be giving up a little in the physicality department — although the Dallas native plays as tough as any player on the Kansas roster — it will be his intelligence, film work and quickness that he’ll lean on to try to slow down Dort. Year after year, season after season, Self enters the final game before Christmas break hoping for complete focus in the face of looming distractions from the holiday and winter break. This year certainly is no different. 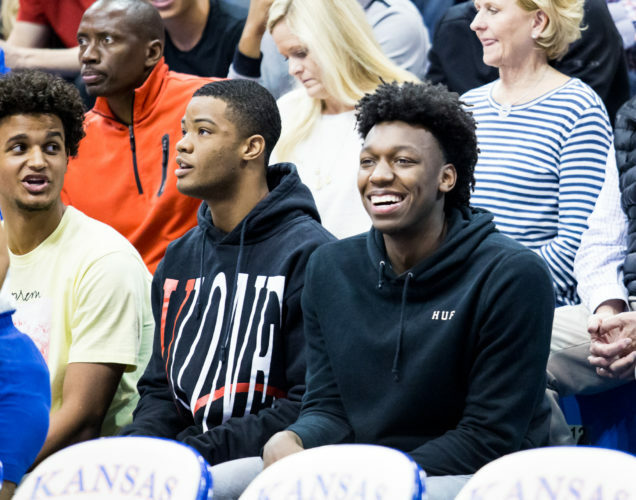 Following tonight’s game, the top-ranked Jayhawks will scatter for a few days to spend time with friends and family and enjoy a little break from basketball. 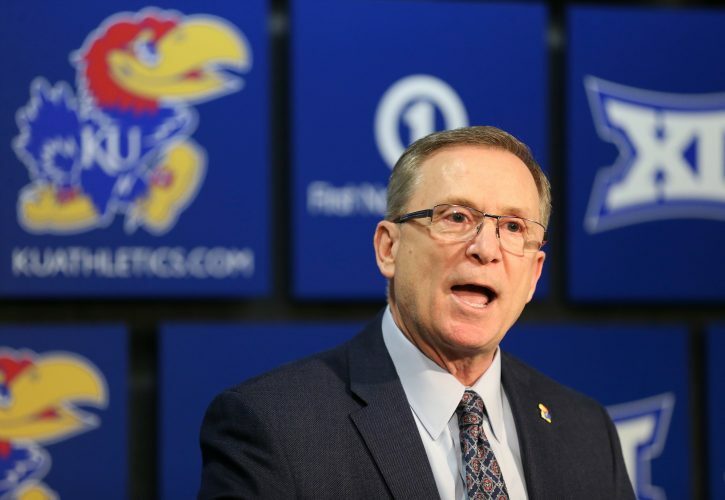 The KU players will report back to Lawrence on Wednesday to begin preparations for Eastern Michigan on Dec. 29, which will be the team’s final nonconference game before the start of Big 12 Conference play on Jan. 2, and Self is hoping that the Jayhawks are not too eager for the upcoming break or Big 12 play to allow it to distract them in this one. “The best way to have a good Christmas is to win your last game before Christmas,” Self said. “We’ve done it both ways. Christmas is much more pleasant doing it the right way. You’re going to have a good Christmas no matter what because you’ll be with family. But for everybody to have the best Christmas (this year) is to play well against Arizona State. ASU coach Bobby Hurley on Thursday said his team had a different view of that potential holiday distraction. Arizona State enters the battle having lost two of its last three — vs. No. 6 Nevada in Los Angeles and at Vanderbilt — and averaging 81 points per game while giving up 72. Las Vegas lists Kansas as a 5-point favorite over the Sun Devils in this one. G – Marcus Garrett, 6-5, 195, Soph. G – Remy Martin, 6-0, 170, Soph. G – Luguentz Dort, 6-4, 215, Fr. F – Kimani Lawrence, 6-7, 210, Soph. F – Zyland Cheatham, 6-8, 220, RS-Sr.
F – Romello White, 6-8, 235, RS-Soph.